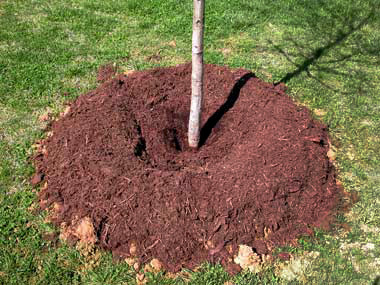 Putting down mulch around your newly planted tree helps it retain moisture, suppresses weeds and moderates the soil temperature. It also protects it from being accidentally hit by lawn mowers. Put a one meter ring of mulch (ex. woodchips, straw, compost) around your tree about two to four inches high. Make sure the mulch doesn’t touch the trunk which can cause the bark to get too wet.